The mostly consolidated landscape of the global baby monitors market is expected to remain the same, according to a research report released by Transparency Market Research. In 2015, nearly 60% of the global baby monitors market was taken up by the global leaders in the market: Samsung Electronics Co. Ltd., Dorel Industries Inc., LOREX Technology Inc., and Motorola Solutions, Inc. The market is expected to remain a highly competitive one over the coming years, thanks to a growing demand for baby monitors and the release of sophisticated technologies aimed at making baby monitoring accurate and easy. Nearly 82.5% of the evaluation of the global baby monitors market in 2015 was accounted to wireless monitors. Geographically speaking, the demand for baby monitors has been exceptionally high in North America, followed by Europe. The growth of scope of baby monitor sales in the emerging economies of the world is keeping the competition intense for the time being. According to the report, the global baby monitors market is expected to expand at a CAGR of 4.4% within a forecast period from 2016 to 2024, in terms of value. The market was calculated at US$911.9 mn at the end of 2016. Owing to the several factors augmenting its growth rate, the global baby monitors market is expected to reach US$1.29 bn by the end of 2024. “One of the key drivers in the global baby monitors market today, is the emergence of a significantly high number of online vendors and retailers for baby monitors. While baby monitors have been available to common consumers through the conventional sources such as department stores, the incoming wave of ecommerce has substantially increased the scope of growth of the market. Not only can vendors and retailers display a larger range of products online, but customers find it much easier to place and order online and have the product delivered at their doorstep,” states a TMR analyst. The global baby monitors market is also being driven by the increasing scope of business for all players within the emerging economies of the world. Nations from Asia Pacific, Latin America, and the Middle East and Africa are showing a high rate of increase in the demand for baby protection and baby care products, primarily due to increasing disposable incomes and growing awareness of product availabilities. Baby monitors allow parents to maintain audio-visual supervision over their children even in the case of day care services, thereby being highly preferred devices. The emergence of cloud computing and internet baby monitoring services is also allowing parents to keep an eye on their children over greater distances. There are two causes of a reduction in the overall demand for baby monitors worldwide. One of the key restraints on the global baby monitors market at the moment is the growing security concerns regarding the leaking and misuse of baby monitor feeds by criminals. At the same time, the global baby monitors market is suffering from the steady fall in birth rates in certain regions of the world, which is being cause due to the growing stress levels and predominantly sedentary lifestyles. “There is still a massive untapped market for players in the global baby monitors market to discover, within Asia Pacific. 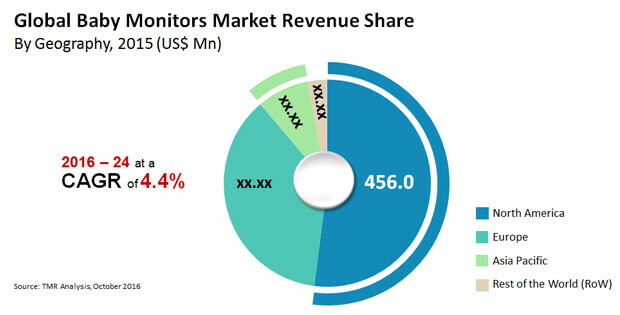 The region holds a high density of population and growing disposable incomes are likely to fuel the demand for baby protection devices and services over the coming years, thereby creating significant opportunities of growth for players in the global baby monitors market,” adds the analyst.